Since the original Sims came out many moons ago I have rushed out and bought every addition to it and I’ve been thoroughly sucked into the Sims 3 Store also. So I feel a little bit sad that I’m not feeling the same excited anticipation about this one. Instead I’m approaching it with caution. 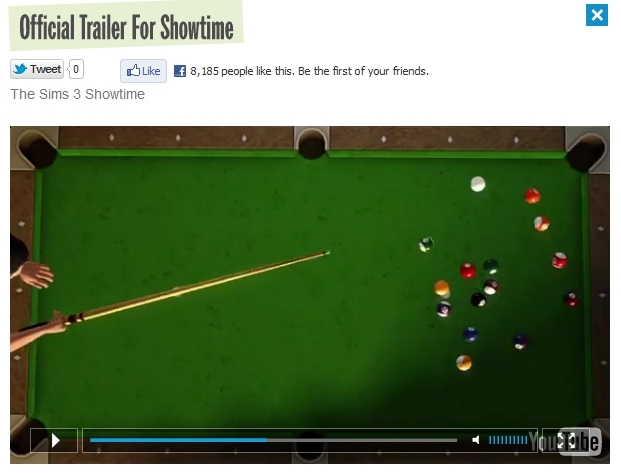 However I am a fickle simmer like many others, if anything will swing me towards it is has to be that damned pool table as I’ve wanted that back in my game ever since I made Merlotte’s Bar & Grill and had to use the foosball table instead. So, I will be watching the first fan reviews of this EP closely to see what the real deal is and, talking of real deals, I’ll most likely be shopping around to find it at the cheapest price, as for once I won’t be rushing out on release day to get my grubby little paws on my usual drug of choice. Let me have your considered thoughts on it, I’m genuinely interested as to what might pull you in or repel you from buying the Showtime EP. 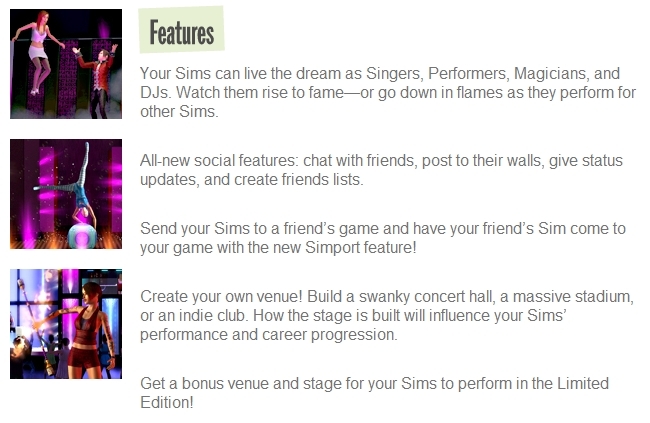 Edit: As if by magic the Sims 3 Producers updated their blog today with a little more info about the pack – I’m still on the fence until I see the community reviews but it does sound like a whole new in game menu will come along for the social features. As for the Katy Perry Limited Edition announced today, it’s not my cup of tea although the official forum seems fairly keen, I feel celebrity endorsements sully the game somewhat. But the marketing seems to be working a treat on other people so I’m clearly in a minority. This entry was posted in The Sims 3 and tagged Electronic Arts, Expansion pack, Facebook, Showtime, Sim, Sim Games by krazyangelkat81. Bookmark the permalink. The expansion pack seems useless for me to buy. I probably won’t buy it and wait til Seasons come out. Well, I’m hoping they make a seasons. Lee – thank you for you comment – you are echoing a cry I have heard across the community for seasons. I do think seasons will seriously up the graphic requirements for Sims 3 however which is why I think EA are avoiding the topic. Your reaction is proof that they may have made a mistake with this EP, if it damages their sales they might have to reassess their future plans. 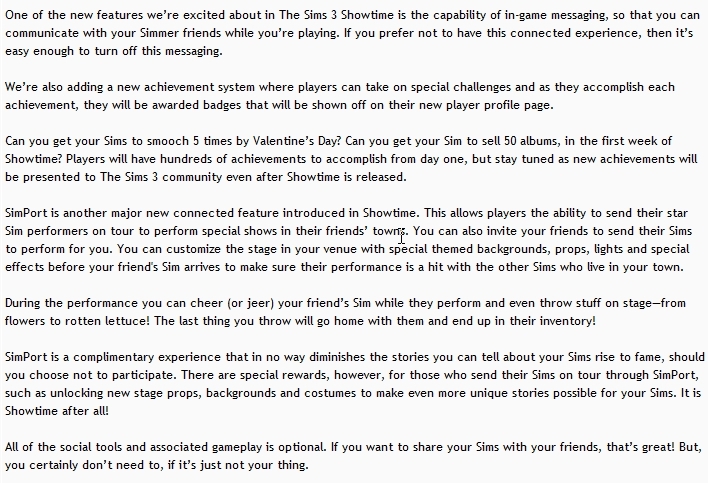 However there is a whole other section of the Sims 3 community that seem very excited about the social features. It just makes me sad that it has caused such a division in the community. I’m with you both, Kat and Melody. I’m very much sitting on that same pointy fence, uncomfortably. At the time this comes out, I may well not be able to purchase it, anyway, due to income restraints. However, even if I can, I’ll probably wait a while–something new for me. I’ve always tried to make sure I’ve had my new EPs on release day or within a few days thereafter. This time…maybe not. Your article was very well done. Good job, Kat! Hearing you say that Linda definitely rings alarm bells as you have always been among the first to buy and explore new additions to the game. I understand money may also be an issue which is why more than ever simmers are looking for good value and quality content. This is the first expansion that I don’t have that “I cannot wait” feeling. Perghaps I will buy it bit I won’t use the simport at all. Don’t trust it look the circus at ea forums at the moment with that crazy poster! Also I know what you mean about the lack of real security at the official forum. The fact that EA are trying to reassure people about the security of the new features by saying that they will be similar to those used at the official site is actually a bit laughable. They can’t stop the trolls there so how will they stop them in game? Amen to that Faithy…I’ve said for a Looooong time that EA should fix their damn bugs and they always fix some but conveniently forget about others and then seem to create more. This bug apathy issue has driven some simmers like Eric (ejnarts1) away from EA totally. And this social media inclusion will drive away others. I really hope they’ve got something amazing they can pull out of the bag to pull a few people back or the franchise will be in trouble! I feel basically the exact same way! I’m very hesitant, and will also be cautious about this EP! Very well written article, and I completely agree with everything you’ve said. I am extremely nervous about how this EP will change the way that I play the game, and I’m honestly not sure if I will purchase it. I agree with FaithfulApostle about EA needing to fix bugs as well. I think they should take a pause, fix a lot of the problems that many people have with the current games, and then think about making more EPs. I am a long time Sims lover, and the last thing that I want is for the game I’ve always known and loved to be completely changed, and turn into something I cannot enjoy. Thank you for your comment, I’m glad so many of us are voicing our concerns about this publicly as it seems to be the only way EA will listen. More recently I was angry when they did the live Q&A about Showtime and deliberately stated at the start that they were “not going to focus on the social features”. It was a very obvious sidestep which is rude to their customers when you consider that 2 of the key features for this EP are centered around social interaction. So far I feel that I do not have enough information to make a decision to buy the pack. I am still thoroughly on the fence if not a bit further away from it. Yes I watched it and was impressed by the content of the EP, but annoyed that they didn’t explain more about the social parts of it. I hope that they will listen too because I think if people are able to learn more about it, they will be able to convince more people to try it!